This post revisits many of the points made in a similarly-titled post 18 months ago. It's a worthwhile exercise, because many people seem to accept, as an article of faith, that our huge and rising federal debt will crush the economy in the future. As I explain here, it is not repaying the debt that creates a problem, it is the spending that requires taking on the debt that crushes the economy. From a macro perspective, debt is a zero-sum game, since one man’s debt is another man’s asset. Debt is an agreement between two parties to exchange cash now with a reversal of that exchange, plus interest, in the future. It's a voluntary exchange, and if the borrower lives up to his future obligations, then presumably everyone is happy. If the borrower fails to repay his debt, then he benefits by being relieved of some or all of his debt service obligations, while the lender suffers by not receiving some or all of his expected cash flows. If the U.S. government defaults on its debt, the net effect will be to cause a massive transfer of wealth from the private sector, and the rest of the world, to the U.S. government. Those who lent to the government will be devastated, but taxpayers will be relieved. The rationale behind every debt transaction is that the borrower uses the lender's money for some productive purpose that will generate a cash flow sufficient to service and eventually repay the debt when it matures. So taking on debt is not necessarily a bad thing. Indeed, it is usually a very good thing, since both borrowers and lenders benefit; the borrower creates new economic activity while the lender collects income. Of course, issuing new debt does not by itself create new demand or otherwise expand the economy; this happens only if the debt is put to productive use, and it happens over time. By the same logic, servicing or paying off debt does not extinguish demand, nor does it otherwise shrink the economy—it is not equivalent to flushing money down the toilet. The money borrower B pays to lender A is money that A will spend on something else. The amount of money available to the economy doesn’t change when debt is serviced or paid off. Aggregate demand doesn’t change either, because money simply changes hands. If and when the federal government services and pays down its gargantuan debt, it will be distributing massive amounts of money to its lenders in the private sector and the rest of the world. There is no a priori reason to think this will be bad for anyone. Debt becomes problematic, however, when the money borrowed is put to unproductive use, because that leaves the borrower without the resources to repay the loan, and that will eventually disappoint the lender. Most of the money that Uncle Sam has borrowed in recent years has not been put to productive use, and that is a big problem, because the economy has not grown sufficiently to pay back the debt. The federal government has borrowed trillions of dollars in order to 1) send out checks to individuals who are retired, unemployed, disabled, and/or earning less than some arbitrary amount; 2) pay salaries to millions of bureaucrats, 3) subsidize bloated state and local governments, and 4) subsidize corporations engaged in activities (e.g., wind farms, ethanol production) that would otherwise be unprofitable. The money was essentially wasted, since it wasn't used to create new sources of revenues with which to service the debt in the future. We have flushed trillions of dollars down the toilet already, and we have very little to show for it. The economy has already suffered because we have squandered our scarce resources; we have eaten much of our seed corn, and our future harvests are looking insufficient. 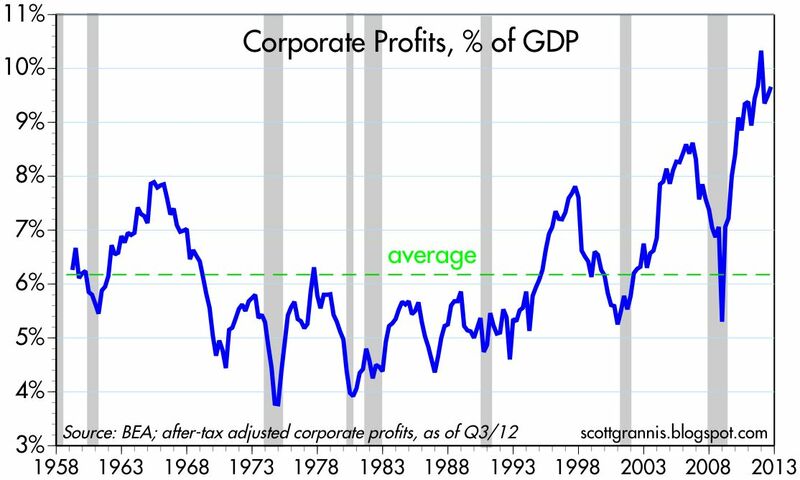 Think of it another way: over the past several years, the net after-tax profits of U.S. businesses have been almost identical in size to federal budget deficits. Businesses have contributed trillions in profits to the capital markets, and the federal government has borrowed trillions from the same markets. Trillions of dollars have changed hands, but growth has been disappointing because the money was simply taken out of one person's pocket and put in another's—it wasn't spent productively. I think this discussion goes a long way towards explaining why this has been the weakest recovery in history. The burden of our debt binge is already upon us because we have borrowed trillions of dollars to support consumption, rather than new investment. What matters in the future is how productively we spend the proceeds of future bond sales, not how we pay off the bonds we've already sold. We can make progress on the margin if we can reduce federal spending relative to the size of the economy, since that in turn will reduce the amount of the economy's resources we waste. Allowing the private sector to increasingly decide how to spend the fruits of its labors will likely improve the overall productivity and strength of the economy, because the private sector is most likely smarter about how it spends its own money. We've got to get the government out of the way if we are to move forward. Here is a random sampling of charts with up-to-date data that tell interesting stories about the economy and the markets. The economy continues to improve on the margin, albeit slowly, but markets are very nervous. The Vix Index is a good proxy for the market's level of fear and uncertainty, and the 10-yr Treasury yields is a good barometer of the market's expectation for future economic growth. 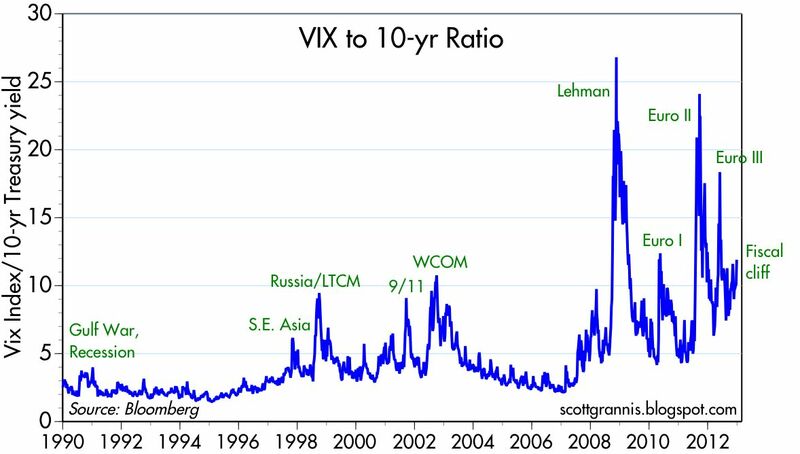 The Vix is elevated today, at just over 20, while the 10-yr Treasury yield is extremely depressed, at 1.7%. As the ratio of the two, shown in the chart above, moves up, the market is become more nervous and unsure about how weak the economy is going to be in the years to come. 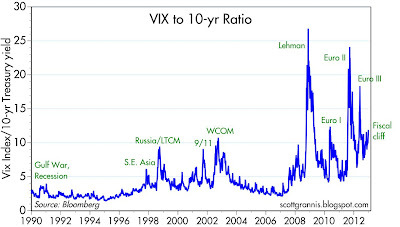 The outlook today isn't as bad as at over times of crisis (e.g., the three Eurozone sovereign debt crises, and the Lehman Bros. collapse), but it ranks pretty high compared to other crises in the past. There's little doubt that the market is very troubled and not at all confident that the economy is going to be growing much in the future. After six years of a disastrous housing market, which saw average prices for homes fall by one-third in nominal terms, and over 40% in real terms, the evidence of a bottom is accumulating. 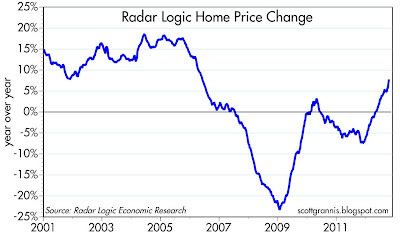 According to the Radar Logic measure, prices are up over 8% in the year ending last October. 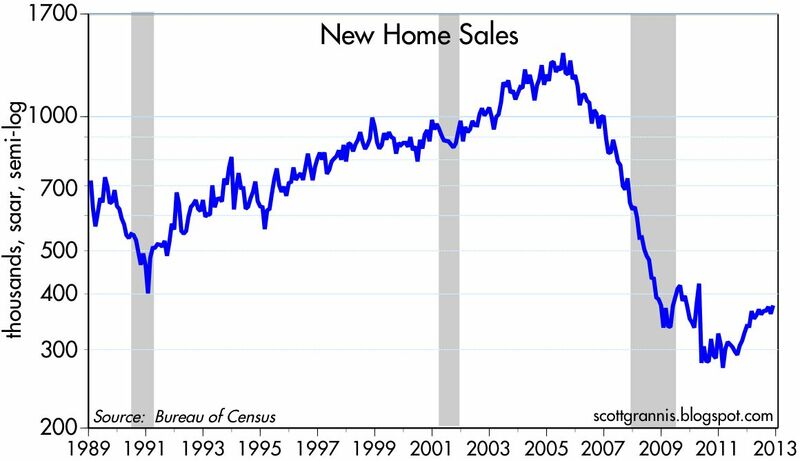 New home sales are up 38% from last year's all-time low. They are still very depressed, but there is some very important improvement occurring on the margin. Lots of potential for growth going forward. 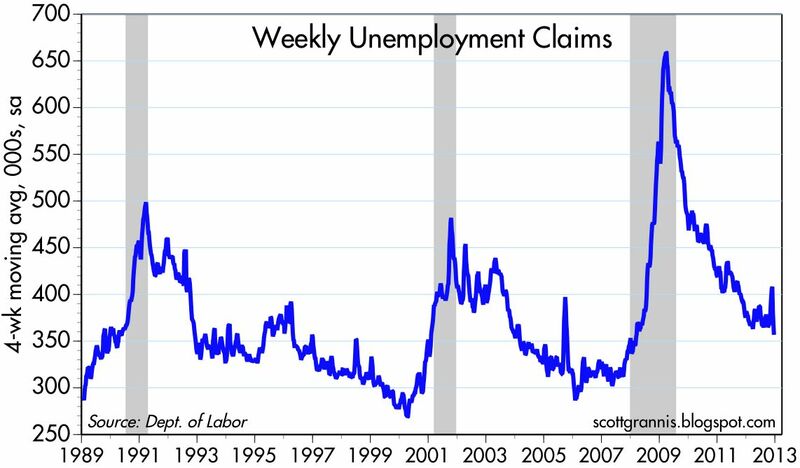 Bad weather impacted last week's tally of unemployment claims, but the 4-week moving average is unlikely to be wildly off the mark. 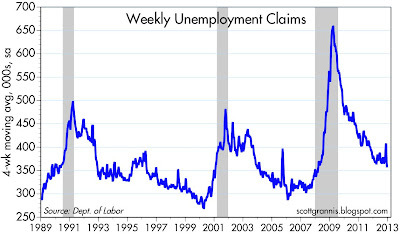 As the chart above shows, claims have hit a new low for the current business cycle. No sign at all of any impending downturn in the economy. 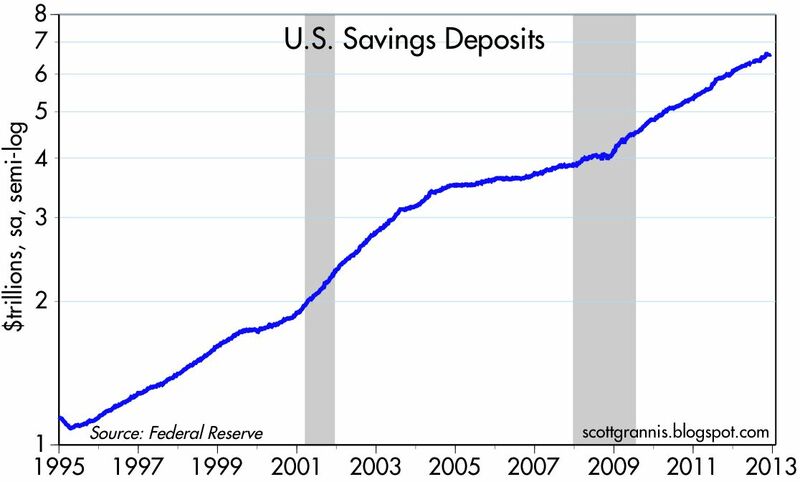 U.S. banks are now holding almost $7 trillion in savings deposits for retail customers, up from $4 trillion just over 4 years ago. Considering that savings deposits are paying almost nothing these days, this is rather extraordinary. People aren't flocking to savings deposits because of their yield; safety is the top concern of most people these days, and that is driven to a great extent by concerns for the future. It also suggests that if consumer confidence were to improve, there could be a veritable flood of liquidity headed away from banks and towards risky assets of all kinds. It's likely that most people with savings accounts fail to fully appreciate how unattractive they really are. It's one thing to stash money in a savings account in order to preserve principal; it's quite another to stash money in a place where it is losing its purchasing power. 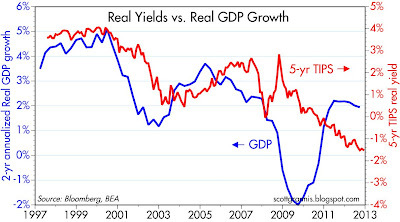 As the chart above shows, the real yield on 3-mo. T-bills—a decent proxy for the real return on savings deposits—has been negative since Feb. '08, and for most of the past decade. 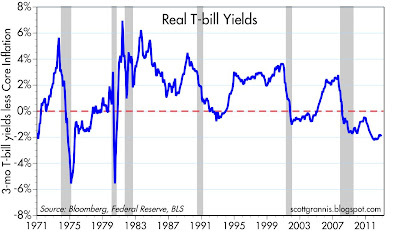 Since Feb. '08, the real return on T-bills has been -6.4%. 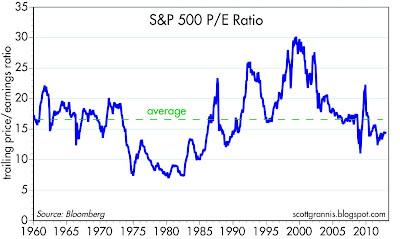 Contrast that to the 5.3% real return on the S&P 500 over the same period. Despite the extraordinary volatility of the equity market over the past 4+ years, stocks have beat savings deposits by over 12%, and money placed in savings deposits has lost over 6% of its purchasing power. Savers, in other words, are paying a huge price for safety that is proving illusory. This is a brief post to update one I wrote last month: "Three under-appreciated GDP facts." 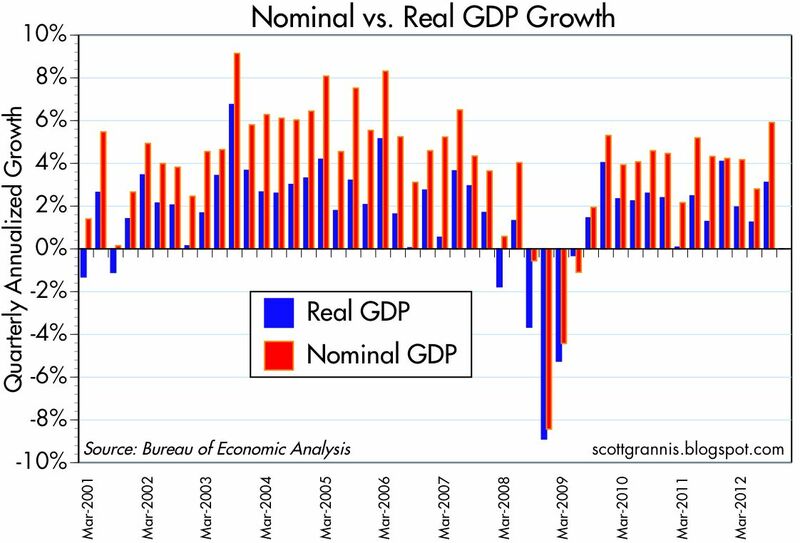 Last month I highlighted the fact that nominal GDP growth in the third quarter was surprisingly strong. Today's GDP revision makes it even stronger: inflation (the GDP deflator) was largely unchanged at 2.7%, but real growth was raised from 2.7% to 3.1%. That amounts to nominal annualized GDP growth of 5.9%, the fastest in over 5 years. The Fed has been aggressively accommodative in its provision of bank reserves to the system, with the objective to boost GDP. Last quarter it would appear to have achieved some measure of success, but it's still a bit early to say whether it was monetary policy which gave us 3.1% growth, or simply the combination of growth in the workforce (about 1%) and productivity (about 2%), both of which are very much in line with historical norms. It's not hard, however, to attribute 2.7% inflation to easy money. 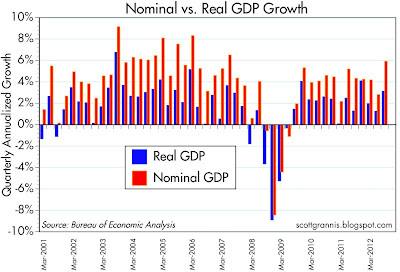 In any event, 6% nominal GDP growth is rather impressive, considering how weak this recovery has been. Existing home sales are up 24% since July 2011, and from the recession low have risen almost 34%. 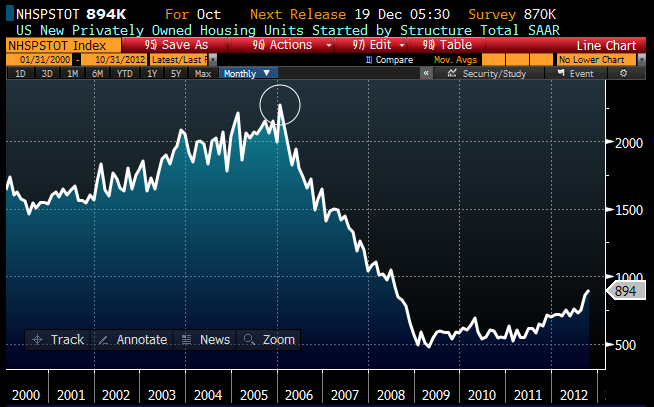 If this isn't a genuine housing recovery, I don't know what is. 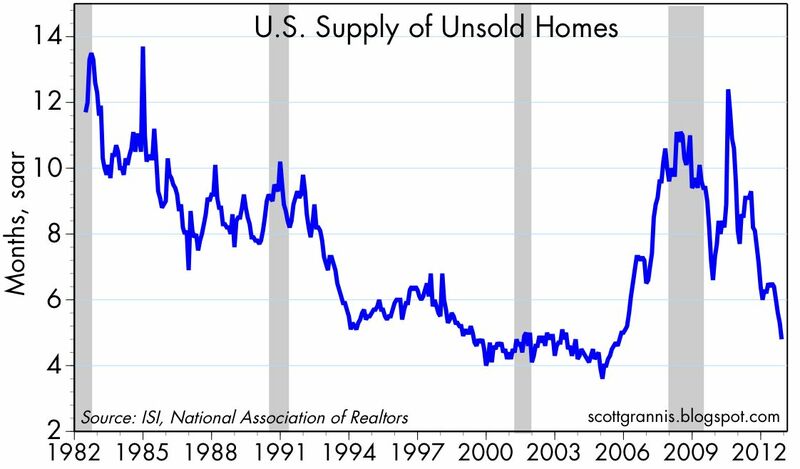 The inventory of homes for sale relative to the sales pace has fallen precipitously, and is now almost back down to the lowest levels of the past several decades. If banks don't start releasing all those properties they reportedly have been accumulating, there is going to be a real shortage of housing and sharply higher prices pretty soon. There are plenty of things to worry about these days. The fiscal cliff negotiations and the likelihood of higher taxes on capital and small businesses; the Federal Reserve's massively expansive monetary policy; the recession in the Eurozone; the lingering threat of sovereign defaults; the political deterioration in the Middle East; the prospect of trillion-dollar federal deficits for as far as the eye can see; the gigantic unfunded liabilities of U.S. entitlement programs; the recent decline in industrial production in most developed economies; the slowdown in Chinese growth; the rising regulatory burdens; the onset of ObamaCare; the very weak U.S. dollar; the relatively tepid growth of the U.S. economy; and the huge gap between current and potential growth. But all is not lost, and the end of the world is not imminent. Here's a collection of 10 charts that tell a story of an economy that continues to improve on the margin. They don't point to any big growth revival, but neither do they point to an imminent recession. At the very least they are comforting. 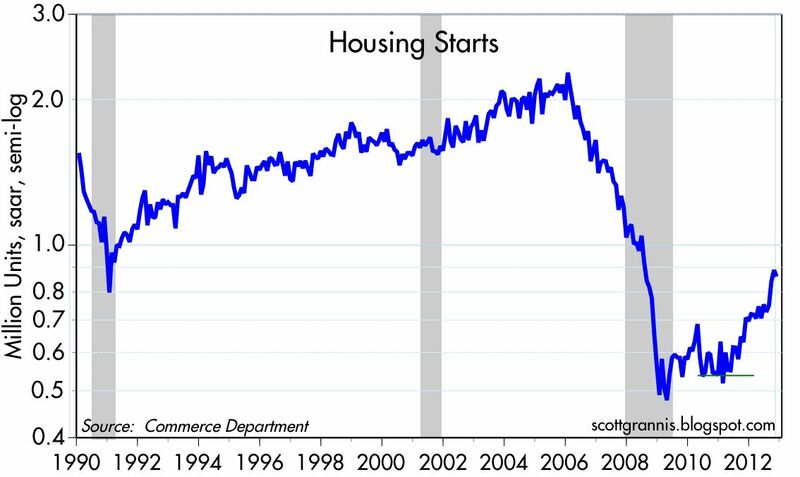 Housing starts are up 60% from early last year, and up 22% in the past 12 months. 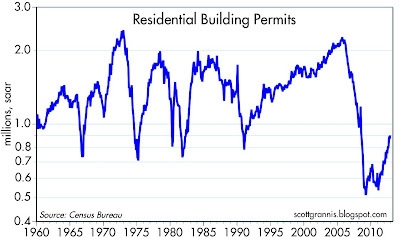 Building permits typically lead starts, and they are up 27% in the past year. The future of residential construction looks very bright. 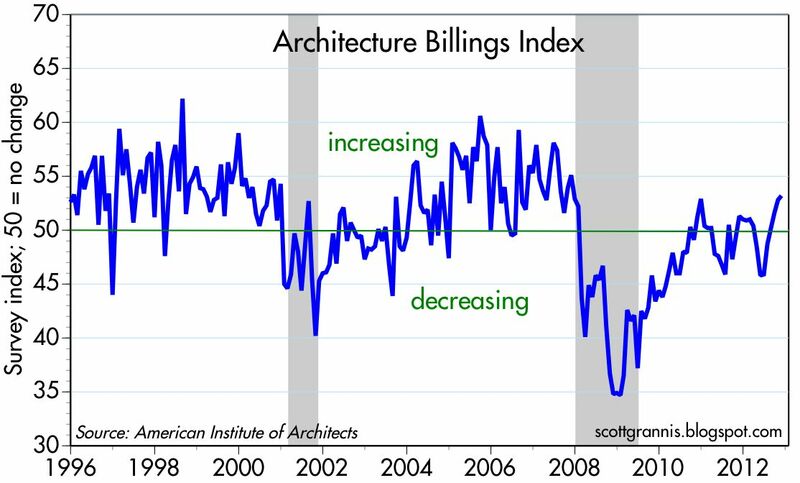 Architecture billings typically lead construction spending by 9-12 months. 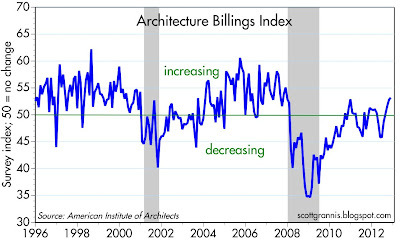 A majority of the firms surveyed for this index in November reported increased billings activity. 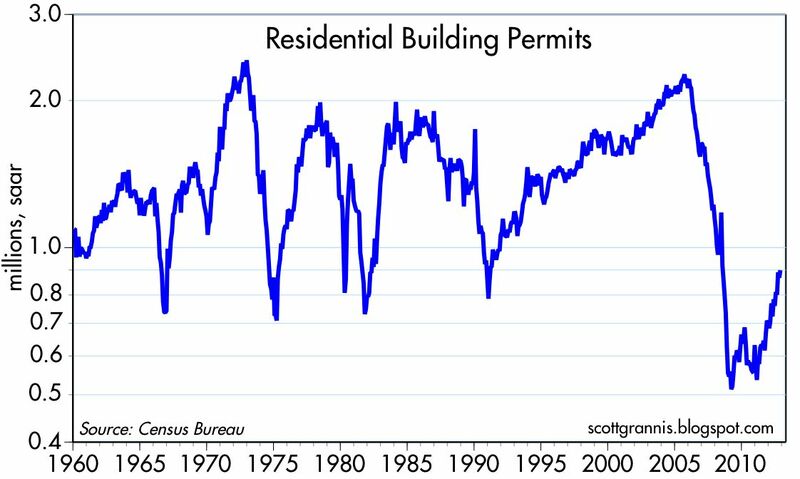 The future of nonresidential construction looks better than at any time in the past 5 years. 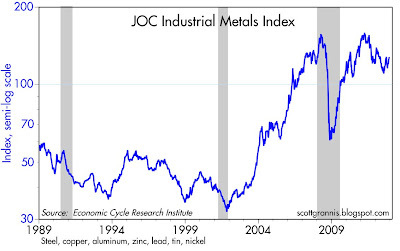 Industrial metals prices are good indicators of global economic activity. Although they are down from recent highs, they are still orders of magnitude higher than they were 10 years ago, and they are up 113% from their Great Recession lows. 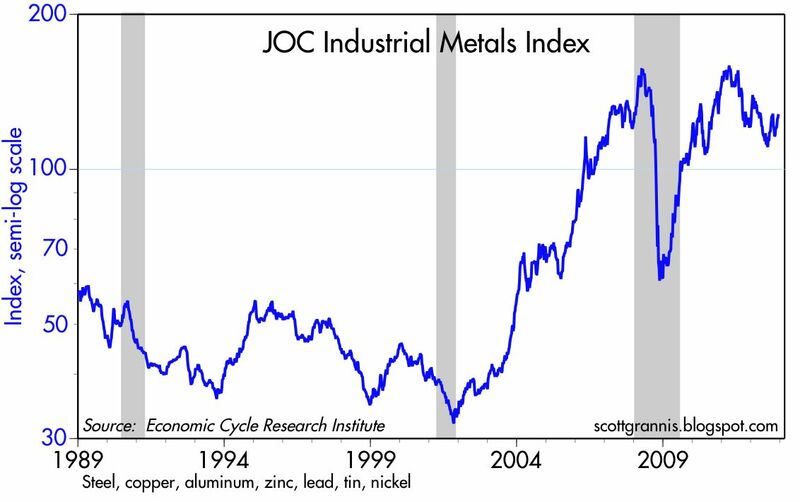 At the very least, these prices tells us that global economic activity remains relatively strong. We all know that the Eurozone is in a recession and that growth prospects are miserable. Yet Eurozone equity prices are up 26% from last year's low. This is not necessarily a sign of strength, but it does suggest at the very least that the situation in Europe is not as bad as many had feared. After all, prices today are about the same as they were in late 1997, 15 years ago! U.S. equity prices have fared better, but still, they have made zero progress in the past 12 years, despite the fact that after-tax corporate profits have more than doubled since then. My take is that equity prices are moving higher because things are not as bad as they market had feared; markets have been priced to a recession, but instead we continue to see that growth is positive albeit disappointingly weak. 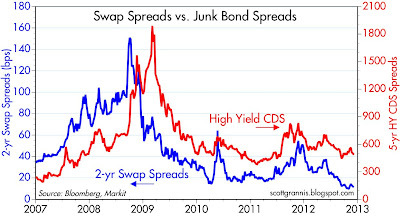 Credit Default Swap spreads show no signs of any fundamental deterioration in the economy. Indeed, they are about as low as they have been since the recovery started. They are still elevated by historical standards, but on the margin they are telling us that conditions are improving. 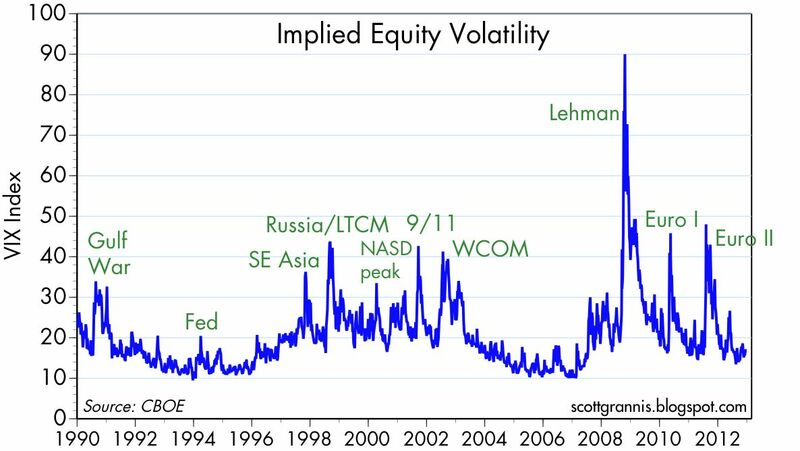 The implied volatility of equity options—the Vix Index—is still somewhat elevated relative to what we would expect to see in "normal" times, but it is far below the levels registered at times of crisis. At the very least, this is telling us that the "fiscal cliff" negotiations are not a do-or-die event for the U.S. economy. Not good, but not bad either. 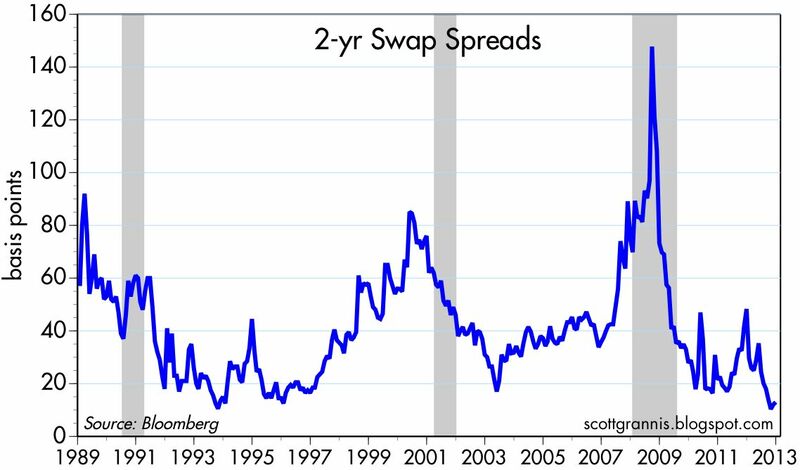 Swap spreads are very important indicators of financial market health and systemic risk, and have proven to be good leading indicators of economic strength. 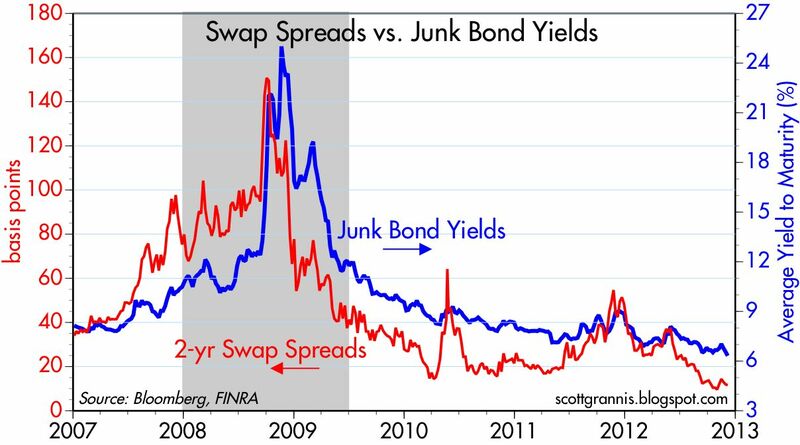 The very low level of swap spreads today is a reflection of very healthy liquidity conditions and very low systemic risk. It would therefore be very surprising for the economy to dip into a recession. 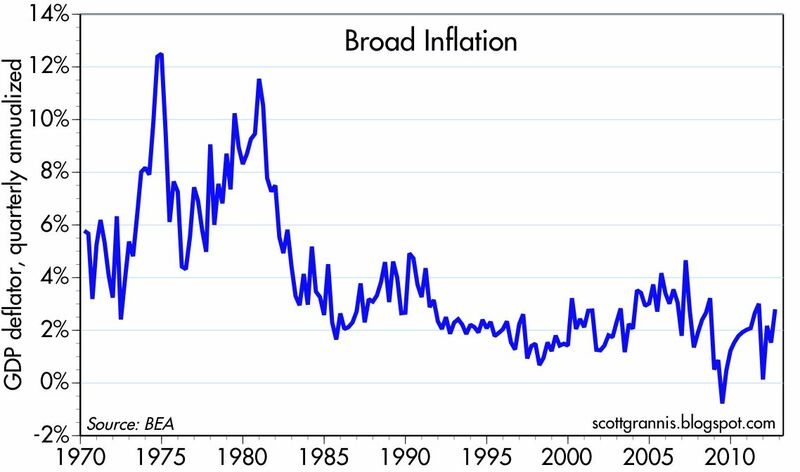 Inflation is neither too low nor too high. This chart shows the quarterly annualized change in the GDP deflator, the broadest measure of inflation in the U.S. economy. 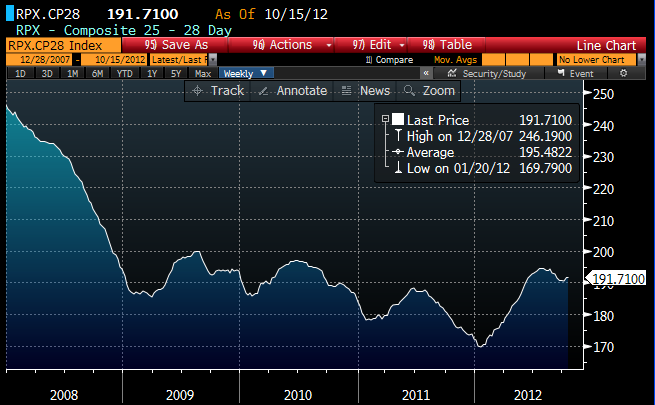 Year over year inflation is running a bit less than 2%, regardless of the measure you wish to use. 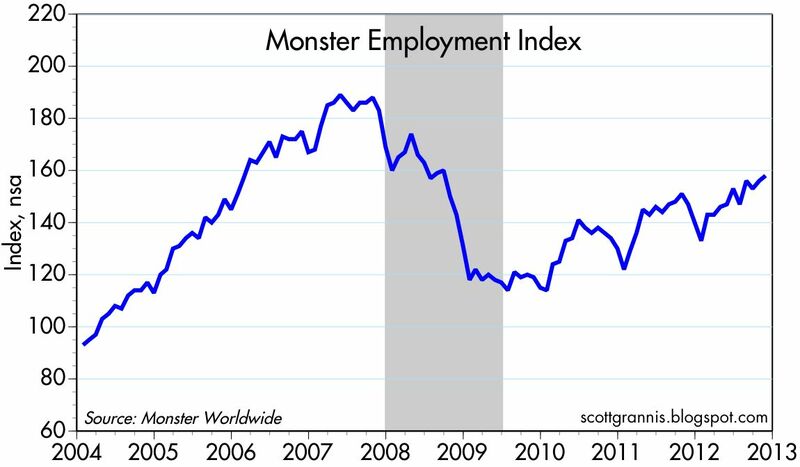 The pace of jobs growth is very disappointing, to be sure, but employment around the world, as well as in the U.S., continues to expand. Slow growth is much better than contraction. My first post on this subject was in early October. Time for an update, since the meme continues. 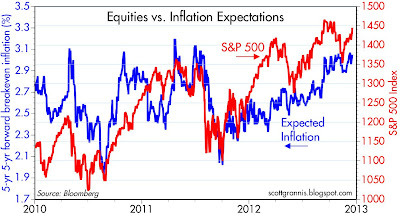 The above chart compares the S&P 500 to the bond market's forward-looking inflation expectations. Since the third quarter of last year, both equity prices and inflation expectations have moved higher in a meaningful way. It would seem that the Fed's quantitative easing efforts deserve some credit (or should I say blame?) for this. Higher equity prices owe more to rising inflation expectations than to stronger growth expectations. Inflation are not necessarily bad for equities, as I explained in my earlier post, because corporate earnings should tend to rise as the price level rises. Another "benefit" to higher inflation is that it boosts tax revenues. Incomes tend to rise with increases in the price level, and that moves people into higher tax brackets (thanks to our progressive tax code), with the result that federal revenues rise without the need to increase tax rates, even if the economy remains weak. That's been the story for the past few years: a very weak recovery but with ongoing inflation of 2% or so has caused federal revenues to increase at a 6.3% annualized pace over the past three years, even as nominal GDP has grown at only a 4.2% annualized pace. Another "benefit" to higher inflation is that it reduces the burden of federal debt. 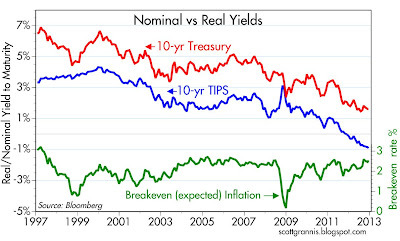 That is especially the case today, since yields on Treasuries are significantly lower than current inflation. Negative real interest rates allow the federal government to pay back its debt with cheaper dollars. This, together with the revenue-boosting effect of higher inflation can result in a substantial decline in the federal deficit burden. Already we have seen the federal deficit fall from a high of 10.5% of GDP to today's 7.0%. While it's good to see debt burdens decline—especially since they are so large—inflation is not the best way to do it. Today's 2-3% inflation, in the context of negative real interest rates on almost all maturities of Treasury securities, is transferring significant wealth from the private sector to the public sector. Over time, this will result in economic growth that is disappointingly slow. 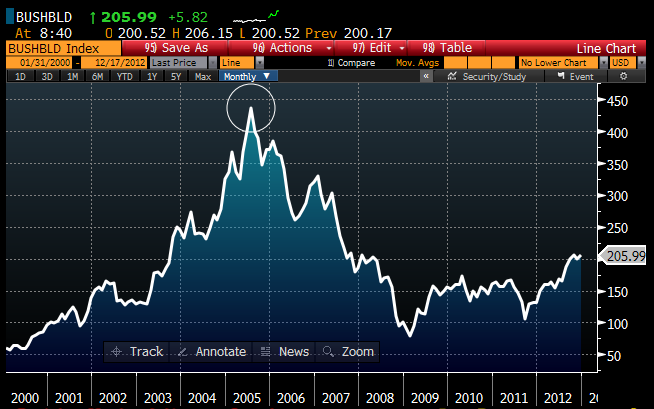 And of course that is what we have seen so far in this recovery, the weakest one in modern times. I don't see things changing meaningfully as a result of the fiscal cliff negotiations. Both fiscal and monetary policy are contriving to continue to transfer wealth to the federal government, and this will keep the economy weak for the foreseeable future. 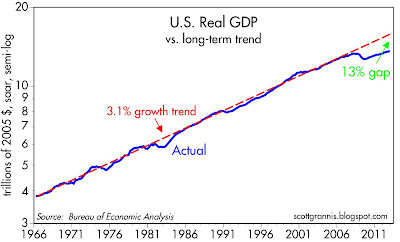 This doesn't mean a recession, just more of the same very slow growth we have seen in recent years. So I think it still pays to be an equity investor, even though the economic outlook is not very bright. 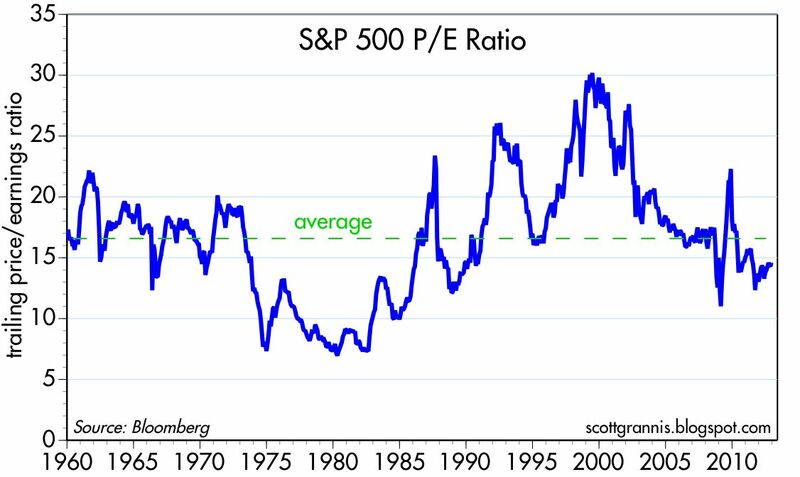 Equities are relatively cheap (i.e., PE ratios are below average at a time when corporate profits are very strong) and they are thus one of the cheaper inflation hedges available to investors at this time. Ben Bernanke, head of the world's largest hedge fund (aka The Federal Reserve), last week announced that next year he plans to borrow another $1 trillion dollars—on top of the $1.5 trillion he's borrowed over the past four years—in order to fund the federal government's CY 2013 deficit and give his shareholders (aka taxpayers) a profit to boot. This plan is otherwise known as QE4. His is a unique business, since he can force the market to lend him money—he simply buys what he wants and pays for it with his "bank reserve checkbook." 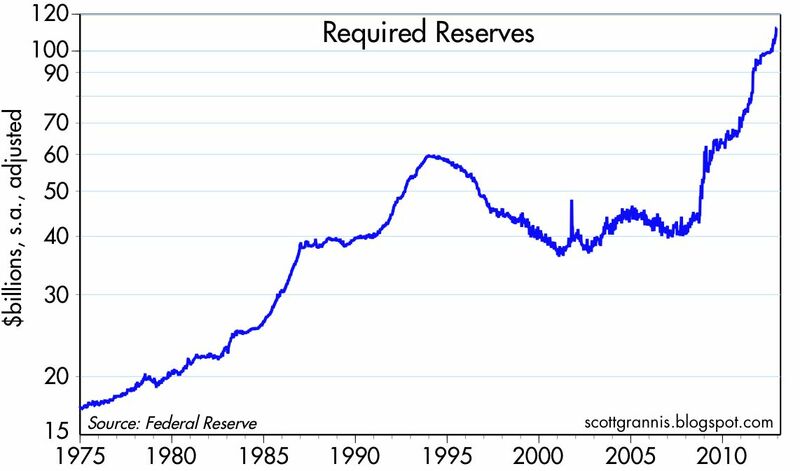 By the end of next year, the Fed will own $1 trillion more bonds, and the banking system will have $1 trillion more reserves, whether it wants them or not. Bernanke can also dictate the rate at which he borrows money; for the foreseeable future that will be the rate the Fed decides to pay on reserve balances held at the Fed, currently 0.25%. 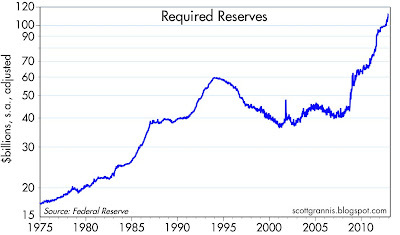 Those who end up with the reserves will have essentially lent the Fed money on the Fed's terms. To be more specific: Next year, Bernanke plans to make net purchases of $540 billion of longer-term Treasuries, and $480 billion of MBS. He will fund those purchases by issuing $1.02 trillion of newly-minted bank reserves. 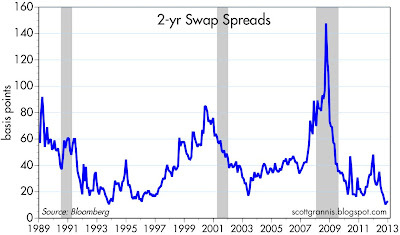 In effect, the Fed will be swapping reserves (which are functionally equivalent to 3-mo. 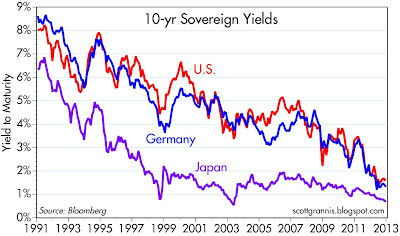 T-bills, the paragon of risk-free assets, but which currently pay a slightly higher rate of interest) for bonds. Since money and bank reserves are fungible, Bernanke's planned purchases should effectively cover Treasury's deficit next year, which, perhaps not coincidentally, looks to be about $1 trillion. 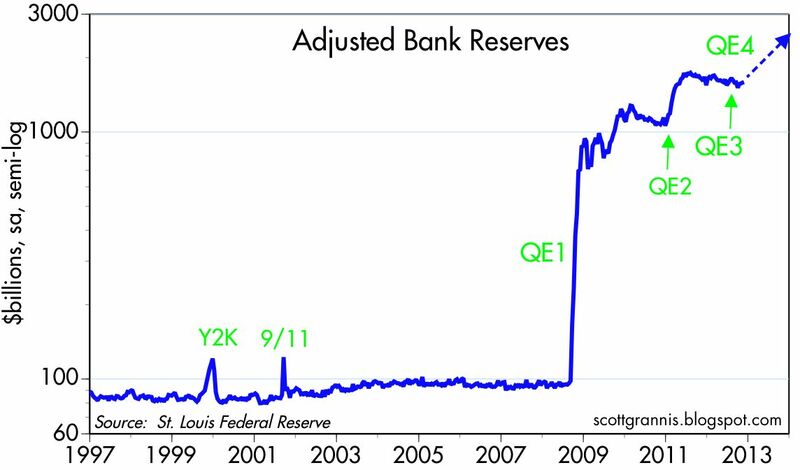 It's important to note here that when the Fed issues $1 trillion of bank reserves, it is NOT "printing money." That's because bank reserves are not cash and they can't be spent anywhere: like pajamas, they are only for use "in house," since they are always kept at the Fed. Bank reserves do have a unique feature, of course, that other short-term assets don't: they can be used by banks to create new money, and in fact, acquiring more reserves is the only way that banks can increase their lending, because banks need reserves to back their deposits. Since banks now hold $1.6 trillion of reserves, of which only $0.1 trillion is required to back current deposits, banks already have an almost unlimited ability to make new loans and thereby expand the money supply. A year from now they will have an even more unlimited ability to do so. That banks haven't yet engaged in a massive expansion of lending activity and the money supply is a testament only to the risk-averse nature of bank management and the risk-averse nature of the public, which now holds $6.5 trillion of bank savings deposits (up 64% in the past four years) paying almost nothing. 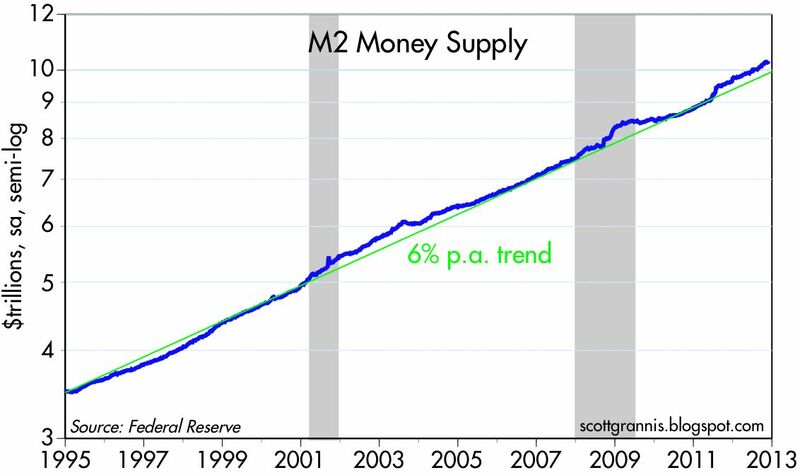 As the above chart shows, in recent years the M2 measure of money supply has grown only slightly faster than its long-term average. 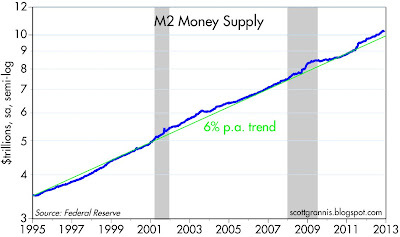 To put it another way: The Fed's massive provision of reserves to the banking system has not resulted in an equally large increase in inflation because the world's demand for money (cash, bank deposits, and cash equivalents like bank reserves and T-bills) has been very strong. Banks, in short, have been content to sit on $1.5 trillion of "excess" reserves because they worry that making more loans and increasing deposits might be a lot riskier. The rationale for hedge funds is to exploit arbitrage opportunities, buying one thing and selling or borrowing another. Even small differences in prices can become lucrative, thanks to the use of lots of leverage. If done successfully, arbitrage can contribute to market efficiency, which in turn can contribute to the health of an economy. Whether the Fed will accomplish the same thing with QE4, however, is an open question. Will banks lend a lot more next year, even though they have an essentially unlimited capacity to lend today? Will increased bank lending fuel genuine economic growth, or will it just fuel more speculation? No one knows. We are in uncharted waters; what the Fed is doing today has never been done before. When faced with issues of daunting complexity and with little or no guidance from the past, one can only begin by trying to reduce things to their simplest form. Here's what I think is a simplified description of what the Fed is planning: Next year the Fed will be purchasing a total of $1 trillion of 10-yr Treasuries and current coupon MBS. 10-yr Treasuries currently yield 1.75%, and current coupon MBS about 2.25%, so the Fed will earn roughly 2.0% on its purchases, while paying out 0.25% on the reserves it creates to buy those bonds, for a net spread of 1.75%. By the end of next year, the Fed will be raking in $17.5 billion per year in profits on their $1 trillion swap, and that will make the Fed the envy of all other hedge fund managers. A real-world hedge fund attempting to do the same thing would run up against the reality of mark-to-market accounting rules. If interest rates on the bonds it buys rise, the mark-to-market losses on the bonds could easily wipe out the interest it's receiving, threaten margin calls and ultimately result in insolvency. For example, a 1 percentage point rise in the yield on 7-yr Treasuries would result in a 6.7% decline in their price, thereby wiping out over 5 years' worth of coupon payments. Mortgage-backed securities could fall in price by even more. A hedge fund would also be exposed to the risk that its borrowing costs could rise, thus narrowing or even eliminating the net interest spread it's earning. Happily, Bernanke doesn't have to worry about any of this, since he doesn't have to mark his bonds to market, and he can keep his borrowing costs below the current yield on his portfolio for at least the next 2 or 3 years, given the FOMC's recent guidance (i.e., it won't start tightening until the unemployment rate falls to 6.5%, short-term inflation expectations exceed 2.5%, and/or long-term inflation expectations become unanchored). And of course, the Fed can always make the interest payments on its borrowings because its "bank reserve checkbook" is effectively bottomless. If this all sounds too good to be true, it is. The Fed may not face the risks that a typical hedge fund does, but that doesn't mean the Fed is not taking on a huge amount of risk at taxpayers' and citizens' expense. Although the Fed need never face insolvency, if mark to market losses got really bad, they could lose their credibility and with that the value of the dollar could be seriously at risk. The Fed's losses might become direct obligations of Treasury, or they might be inflicted on taxpayers and citizens via the sinister "inflation tax." The Fed could eventually repay its borrowings with devalued dollars, leaving the rest of us with deflated balance sheets and deflated incomes. Meanwhile, by allowing Treasury to borrow trillions at no cost, the Fed is acting as an obstacle to badly needed deficit reduction. Although it may seem paradoxical, the biggest risk we all face as a result of the Fed's unprecedented experiment in quantitative easing is the return of confidence and the decline of risk aversion. If there comes a time when banks no longer want to hold trillions of dollars worth of excess bank reserves for whatever reason (e.g., the interest rate the Fed is paying is no longer attractive, or the banks feel comfortable using their reserves to ramp up lending, or the public no longer wants to keep many of trillions of dollars in bank savings deposits), that is when things will get "interesting." More confidence would mean less demand for cash and cash equivalents, and that in turn would mean that a virtual flood of money could try to exit banks (e.g., as people withdraw their savings deposits, and/or borrow more from their banks). 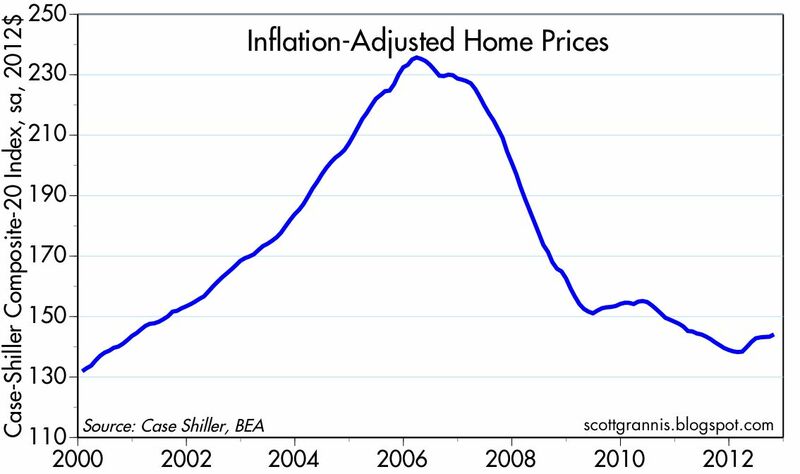 If the public attempted to shift trillions in cash into housing, stocks, gold, or other currencies, the consequences would likely be seen in sharply rising prices and higher inflation. Moreover, higher inflation would almost certainly lead to higher interest rates, which in turn would exacerbate the Fed’s mark to market problem and possibly accelerate the whole process. And of course, higher interest rates will result in significantly higher borrowing costs to Treasury, although this will be mitigated to some extent by Treasury's efforts to extend the average maturity of its borrowings. The Fed reasons that it could deal with declining risk aversion by selling bonds (i.e., reducing bank reserves), not reinvesting principal, and by raising the rate it pays on bank reserves. But it’s not hard to see how things could get out of control: higher rates on bank reserves would likely accelerate the rise in market yields and the mark to market losses on the Fed’s bond holdings, at the same time as its spread eroded. In the meantime, the more bank reserves the Fed creates, the harder it will be to avoid an unhappy outcome. 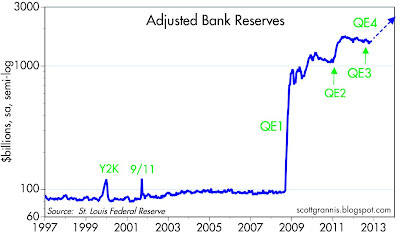 It’s ironic that the Fed is trying, with QE4, to accomplish the very thing that could be its own undoing. Trying, that is, to encourage more confidence, more lending, more borrowing, more investment, and higher prices for risk assets. It’s no wonder that the market remains so risk-averse, since this is hardly a comforting position we're in. For now, that is probably a good thing. But in the wake of the election results and the Fed's latest decision, I am less optimistic today than I have been for several years. Markets do have the ability to "look across the valley" and anticipate upcoming changes in the economy. 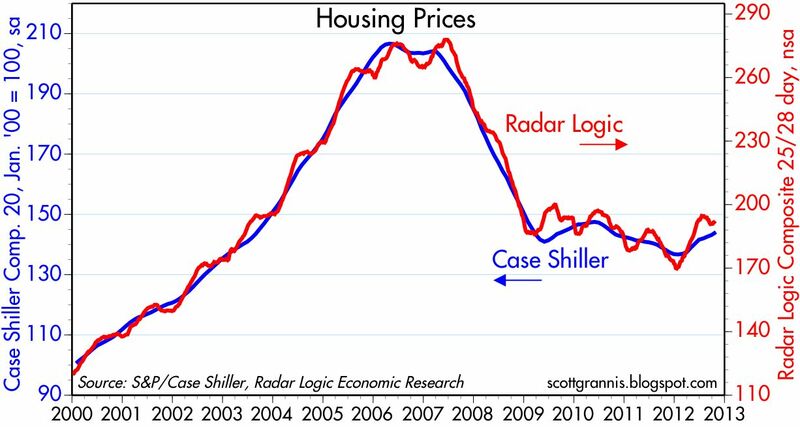 Here are three charts which illustrate how that has happened with onset of the housing market bust and its subsequent recovery. 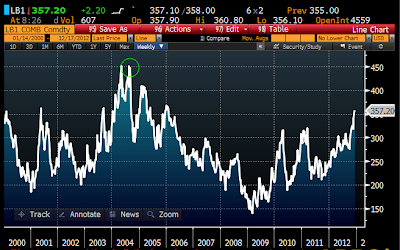 The first of the above three charts shows the price of lumber futures. 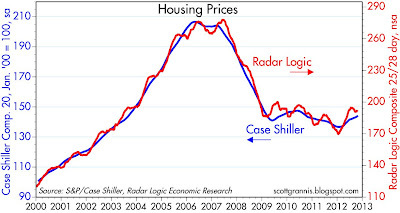 Note that prices peaked in 2004, almost two years before the housing market peaked. 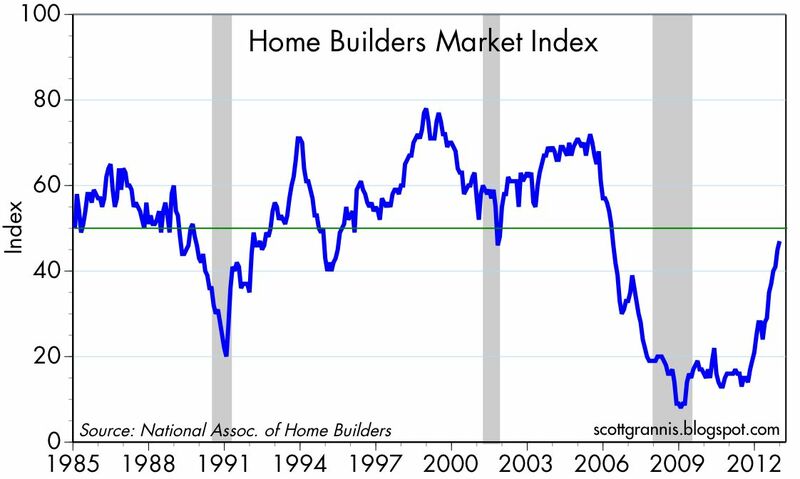 The second shows an index of home builders' stocks, which peaked in 2005, about a year before the housing market peaked. 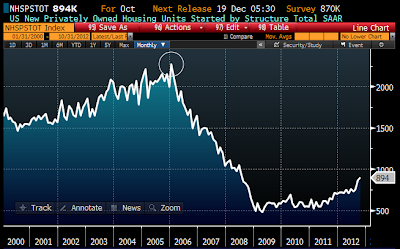 The third chart shows housing starts, which peaked in early 2006. 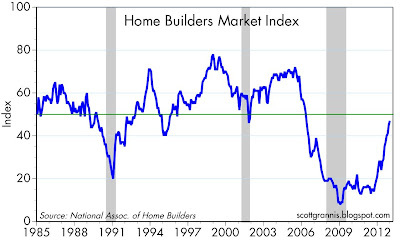 As for the housing market recovery, note that lumber futures bottomed in early 2009, home builders' stocks bottomed around the same time, and both lumber futures and home builders' stocks were rising well in advance of the eventual recovery in housing starts, which occurred in mid-2011. 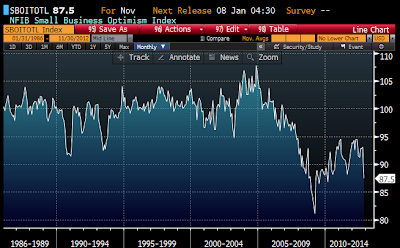 Finally, note that all three indicators are at new post-recession highs. 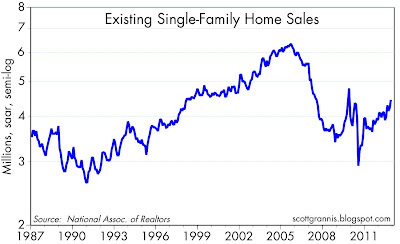 The housing recovery is definitely underway. This last chart is the Radar Logic measure of housing prices (nonseasonally adjusted). According to this index, prices were up 7.6% in the year ending October 15th. 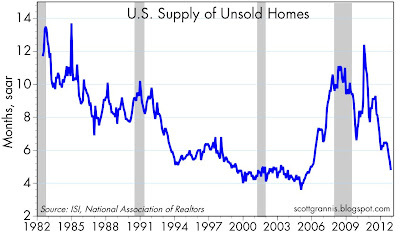 Anecdotally, I continue to see many signs that housing prices have bottomed and are now recovering in many areas of the country. Mark Perry has a nice list here. 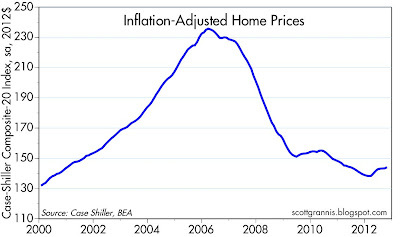 UPDATE: Two more charts updated with data released today (12/18/12), both showing continued improvement in the housing market. UPDATE 2: Below is an updated chart of housing starts, which have soared by 60% since early 2011. Over the past four years, corporate bonds have delivered total returns that rival those of equities. The S&P 500 has generated a total return of 77%; high-yield bonds (using HYG as proxy) have enjoyed a total return of 101%, for an annualized return of 19%; and investment grade bonds (using LQD as a proxy) have delivered a total return of 55%, or 11.6% annualized. The drivers of this spectacular performance were falling yields and lower-than-expected default rates. 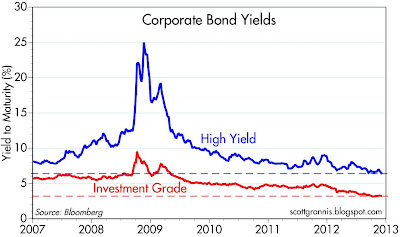 The chart above shows just how much yields on corporate bonds have declined since late 2008. 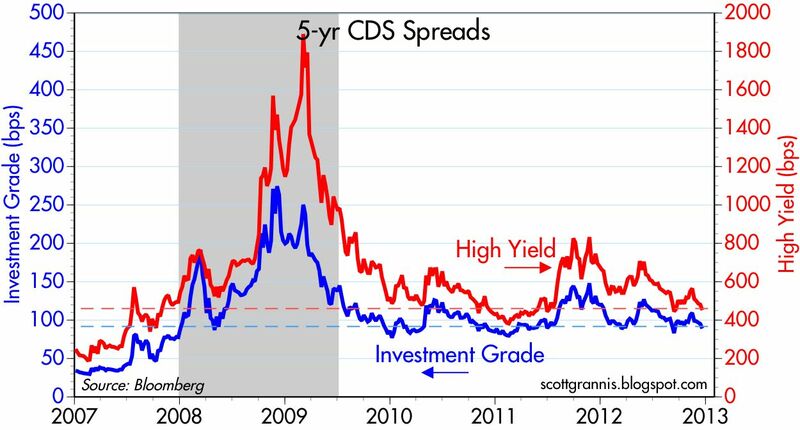 In retrospect, the late 2008 surge in junk bond yields was a once-in-a-lifetime opportunity for investors willing to take the securities off of the hands of the many investors who were forced to sell at super-depressed levels. Towering yields at the time implied a massive wave of corporate defaults which never materialized, thanks to the recovery—however tepid it has been—and to the Federal Reserve's super-accommodative monetary policy stance. So: is this the end of the greatest corporate bond rally in history? 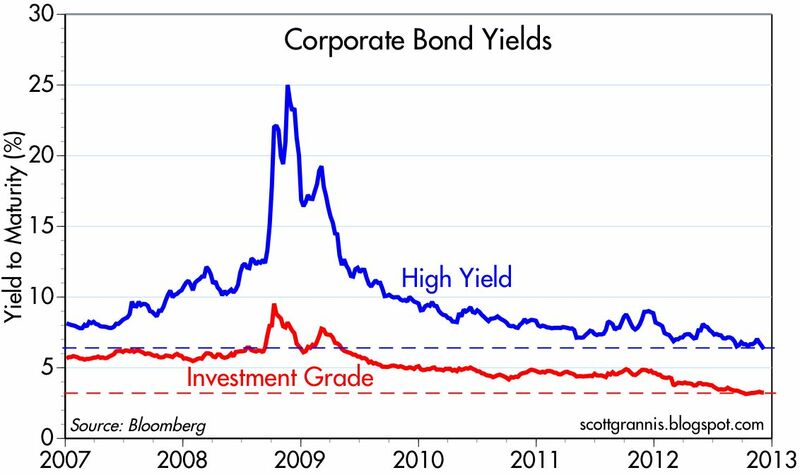 The chart shows that corporate bond yields are as low as they have ever been, so that is a sign that caution is warranted. Digging deeper, swap spreads and credit default spreads, shown in the two charts above, suggest that there is still some room for improvement. 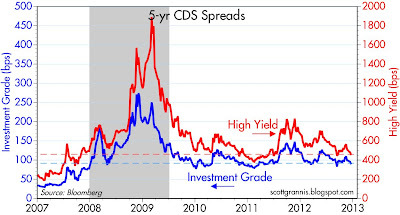 The level of corporate bond yields is at an all-time low, but corporate bond spreads are still relatively wide. 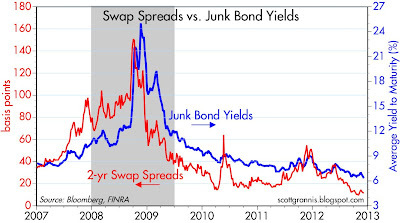 Furthermore, the significant decline in swap spreads suggests that corporate yields and spreads can decline further. If the economy keeps growing at a slow pace, short-term rates remain incredibly low, and monetary policy remains super-accommodative, investors will be all but compelled to continue buying corporate bonds for their still-attractive yields. For example, HYG has an indicated yield today of over 6%, while LQD's yield is almost 4%. The case for corporate bonds would be bolstered fundamentally by continued improvement in the economy and relatively low default rates. A growing economy and easy money are a perfect recipe for improving corporate cash flows, and that is music to corporate bond investors' ears. 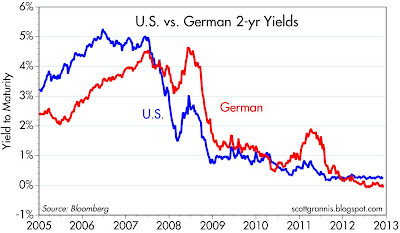 Still, with yields this low, investors should realize that there is a very small cushion against downside risk. If another recession hits, default rates would likely rise in that in turn would erode returns even if interest rates remained very low. If the economy were to strengthen unexpectedly, the Fed would be forced to tighten policy, and that could push corporate bond yields higher, which would also erode returns. It's probably time to start taking some—but not all—of your outsized corporate bond risk off the table, beginning with the investment grade sector. Full disclosure: I am long HYG at the time of this writing. Federal government finances have been terribly unbalanced for the past four years, but the good news is that things are looking better, even as we approach the dreaded "fiscal cliff." The budget deficit peaked at $1.47 trillion in December 2009, equivalent to 10.5% of GDP. As of last month, the 12-month deficit had fallen to $1.1 trillion, or about 7% of GDP. That's welcome progress, and it has come about thanks to very slow growth in federal spending and a decent recovery in tax revenues spurred almost entirely by a growing economy. 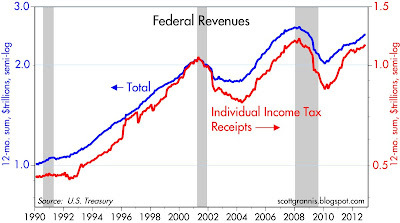 As the chart above shows, the Great Recession was responsible for a 22% plunge (about $575 billion) in tax revenues. Since 2009, however, revenues have risen 22%, or about $455 billion. From the beginning of the Great Recession through today, federal spending has increased about $800 billion, while tax revenues are down only $120 billion. 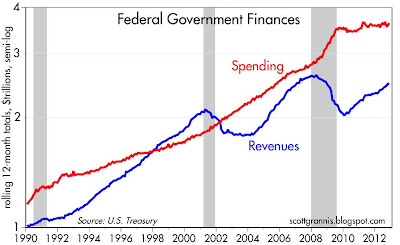 By far the largest factor driving the budget deficit, therefore, has been the surge in spending. Fortunately, that surge has not continued, but neither has it reversed, whereas the decline in revenues has reversed almost entirely. As the chart above shows, individual tax receipts are up about $305 billion from the recession lows, accounting for two-thirds of the increase in total revenues. 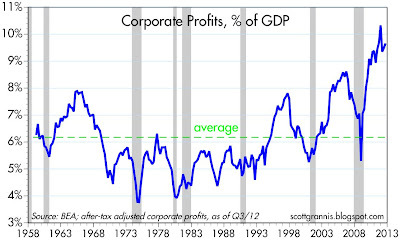 Corporate profits taxes have doubled over the same period, adding $120 billion to total revenues. All of this without any increase in tax rates. The big message here is that federal revenues are highly sensitive to the health of the economy. They have risen strongly since the recovery began, despite the payroll tax holiday instituted almost two years ago, and revenues are likely to continue to increase as the economy continues to grow. 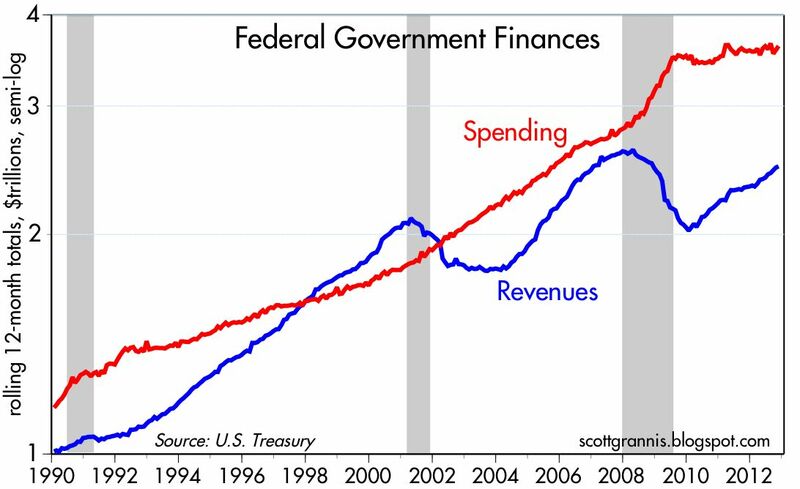 It is spending that is still out of line. If Congress can control the growth of spending going forward, then the budget mess we're in will be resolved without the need for higher taxes on anyone. This is a very important point, since higher tax rates could jeopardize the health of the economy, and that in turn would slow or even reverse the ongoing gains in tax revenue. Balancing the budget only requires that we restrain the growth in spending; going forward, that will be especially important as concerns entitlement spending. 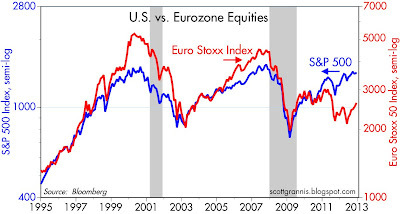 The Eurozone is still in terrible shape, but Eurozone equity prices are up 27% from their June 1st lows. 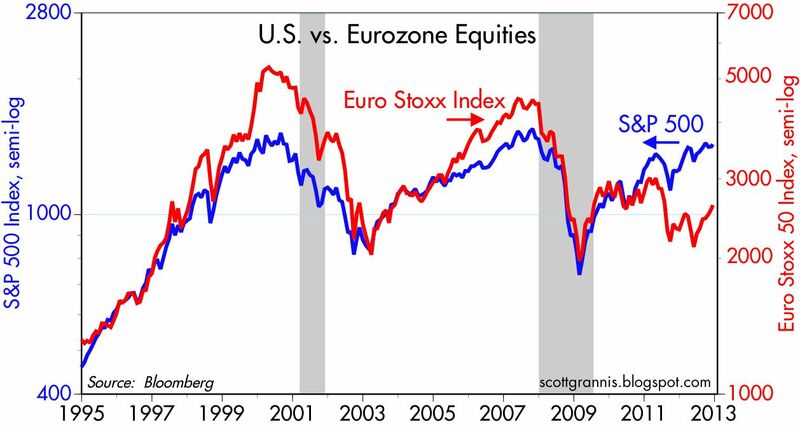 Eurozone equities, in fact, have risen more than twice as much as the S&P 500 over this same period. Are markets turning irrationally exuberant? Not by a long shot. As I argued in my previous post, with all the bad news and pessimism that's out there, it doesn't make sense to think that markets are even slightly optimistic at current levels. What's happening is that valuations have been so deeply depressed that the market is essentially priced to the expectation of another deep recession—but a recession keeps failing to show up. So even modest growth of 2% or so with continued high unemployment ends up being better than the market expected, and that forces the price of risk assets higher. 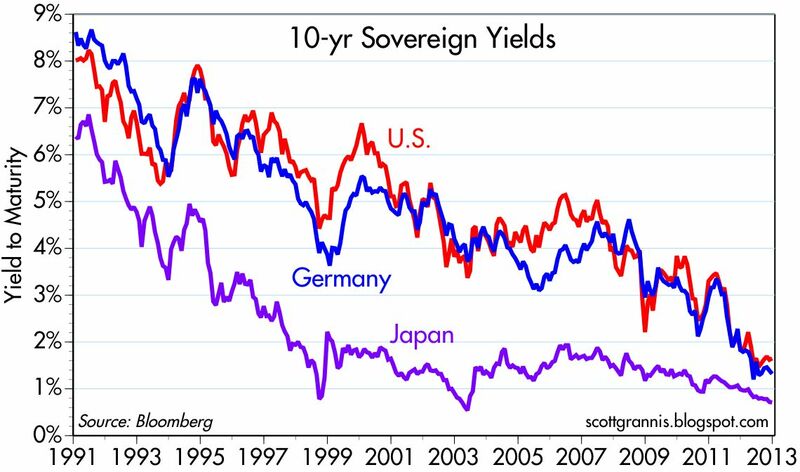 Sovereign yields in all developed economies are at extremely low levels. Plus, they are converging with the extremely low yields that have marked Japan's long economic slump. 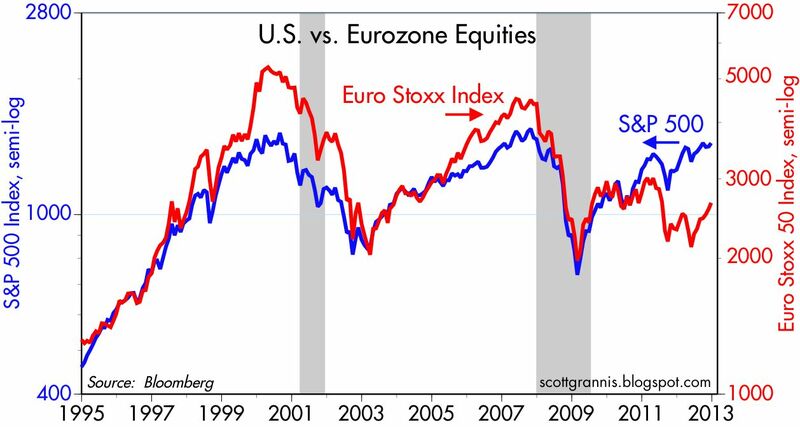 In a sense, the market is saying that the Eurozone and the U.S. economies are destined to suffer the same fate as Japan: prolonged, very weak growth. Real yields on inflation-indexed bonds are negative. Negative real yields are a strong sign that markets expect very weak growth in the years to come. 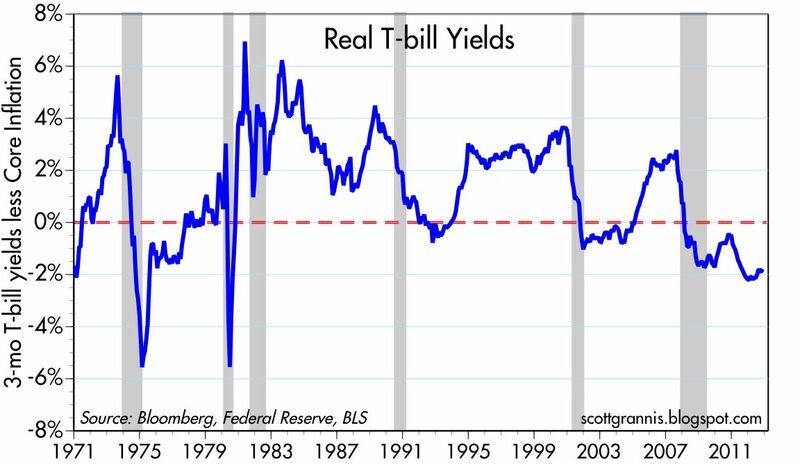 As the chart above suggests, negative real yields on TIPS are pointing to years of zero growth in the U.S.
PE ratios are below average, even though corporate profits are at record-high levels. This can only mean that the market believes that profits cannot maintain current levels and are almost sure to decline significantly in the years to come. 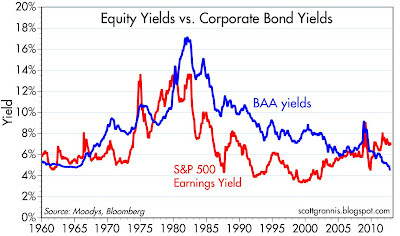 Earnings yields on equities are substantially higher than corporate bond yields. It's rare for the market to allow earnings yields that are substantially higher than the yield on corporate bonds. Investors are apparently willing to sacrifice a significant amount of earnings yields on stocks in exchange for a much lower yield on corporate bonds, since bonds are senior in the capital structure and thus more secure. In normal environments, equity investors are willing to accept lower earnings yields because they expect future capital gains to more than make up for those low yields. It's also a strong sign of pessimism that investors have stashed $6.6 trillion in bank savings deposits paying almost nothing, when stocks are earning 7%. That huge gap is a good measure of the market's extreme risk aversion today. Stocks are edging higher because the market is becoming slightly less pessimistic. The November report of the National Federation of Independent Business was downright gloomy. I'm feeling gloomy as well, since it's very hard to get optimistic about the future, even if Congress somehow manages to find a compromise to avoid going over the "fiscal cliff." No matter what happens in the next several weeks, it's rational to expect tax burdens, regulatory burdens, and healthcare costs to rise over the next year or so. Entitlement programs, from food stamps to disability to social security and medicare, are going to be consuming an impossible share of our national income within my lifetime unless drastic changes are implemented soon. Yet very few in Washington seem to want to do anything about this, our biggest national problem. 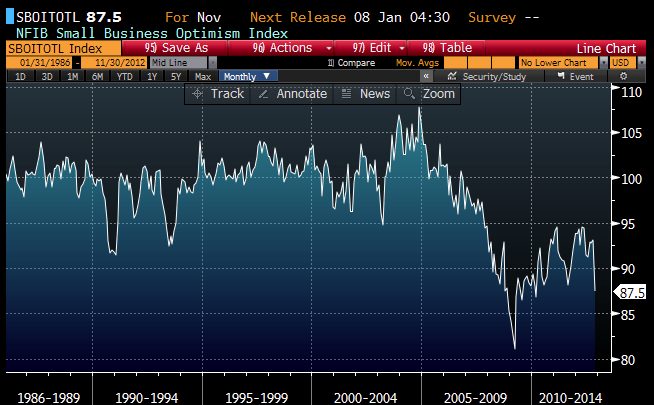 The chart above shows the overall results of the latest survey of small businesses: the Small Business Optimism Index. It fell significantly in November, and is about as weak as it has ever been. 33 percent of exporting value. The weakest part of the survey is shown above. As the NFIB reports, "The net percent of owners expecting better business conditions in six months fell 37 points to a net negative 35 percent." This is worse even than in depths of the 2008-2009 Great Recession. 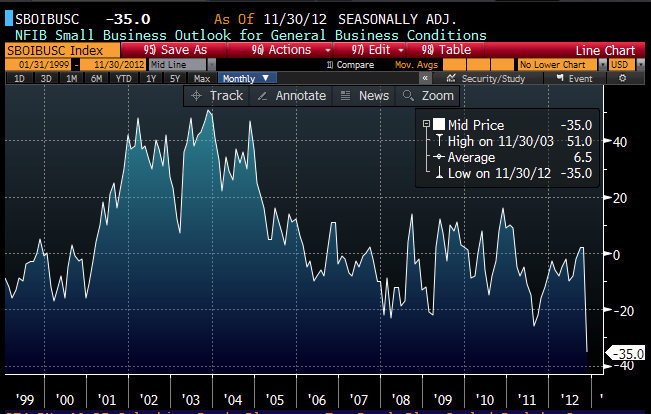 Small business owners overwhelming expect business conditions to deteriorate next year. 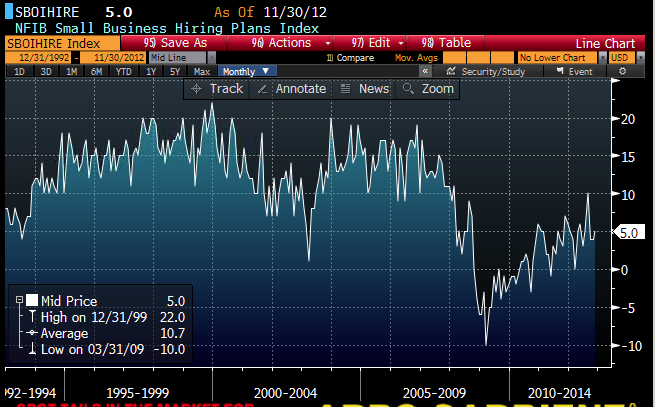 As the chart above shows, only 5% of small business owners plan to increase hiring. This is up from the Great Recession low, but still substantially below normal levels. 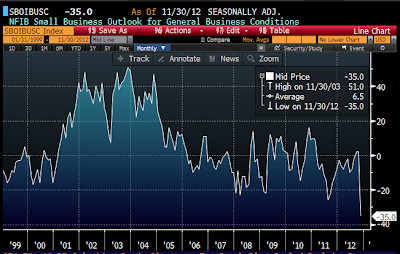 Something bad happened in November—and based on the NFIB survey data, it wasn’t merely Hurricane Sandy. The storm had a significant impact on the economy, no doubt, but it is very clear that a stunning number of owners who expect worse business conditions in six months had far more to do with the decline in small-business confidence. Nearly half of owners are now certain that things will be worse next year than they are now. Washington does not have the needs of small business in mind. Between the looming ‘fiscal cliff,’ the promise of higher healthcare costs and the endless onslaught of new regulations, owners have found themselves in a state of pessimism. The only good thing that can be said about all this gloom and doom is that the stock market is undoubtedly suffused with similar gloomy sentiments. Markets are braced for lots of bad news, so if the future turns out to be even slightly less bad than expected, risk asset prices can rise. 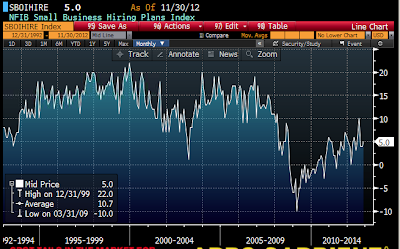 November's jobs report shed no new light on the labor market situation. November's 147K new private sector jobs was in line with what we've been seeing on average for the year to date and for the past three years. 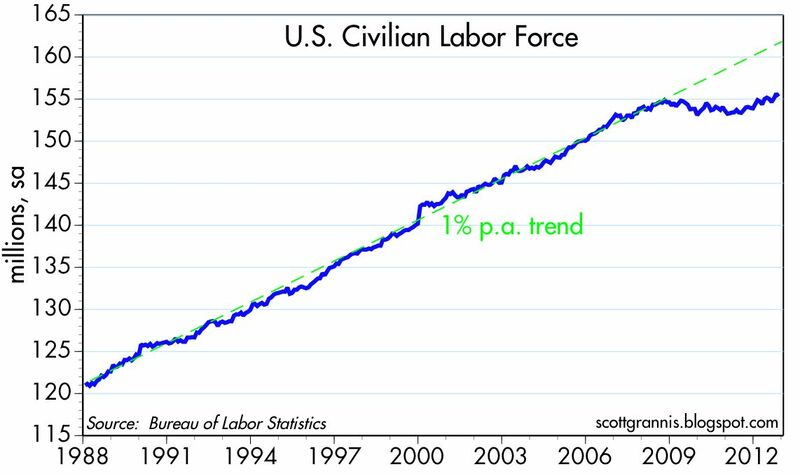 It's slightly more than the 130K new jobs per month that need to be created just to keep up with the long-term average growth of the labor force, which is about 1% a year, so if things continue at the same pace the unemployment rate can decline very slowly from here. It's only declined faster because the labor force has grown very little for the past four years, which in turn is a function of many people deciding to "drop out." The current 1.5% per year pace of jobs growth is unlikely to translate into anything more than 3.5% real economic growth, assuming productivity growth continues to run at the 1-2% per year pace we've seen in recent years. That's OK, but it still adds up to the weakest recovery ever. 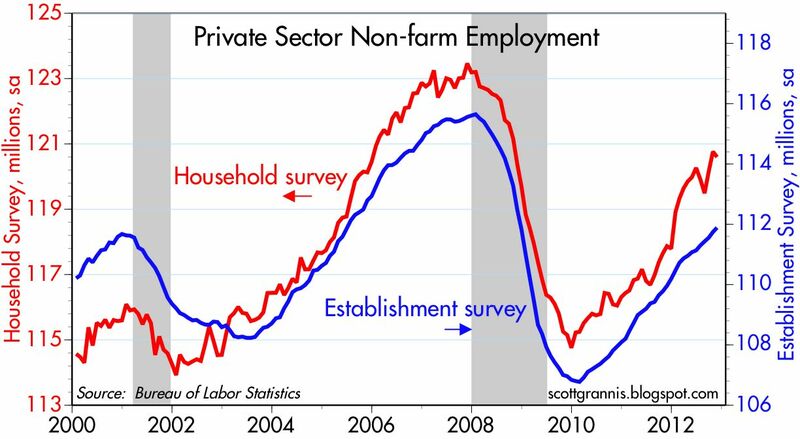 Note the relatively steady growth of private sector jobs as measured by the Establishment Survey (blue line). Both surveys show that the economy has created about 5 million jobs over the past two years. 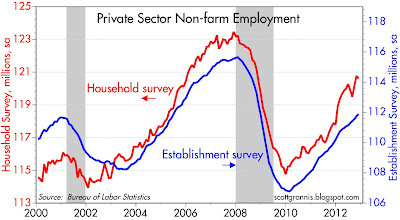 Also note that there is absolutely no sign here of anything like a recession. Jobs growth may be disappointing, but it is still definitely positive. 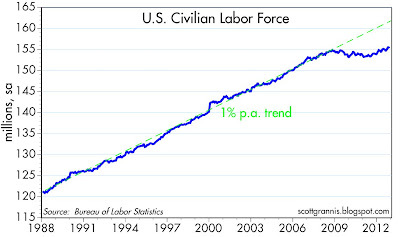 After declining from 2008 through early 2011, the labor force has resumed a 1% annual pace of growth over the past year. But it is still more than 5 million below where it could have been if long-term trends were still in place. 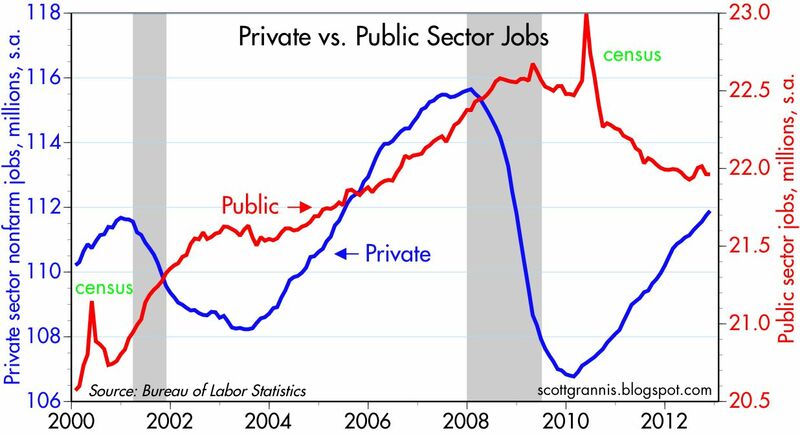 The November report provided more confirmation that the public sector workforce is no longer shrinking. 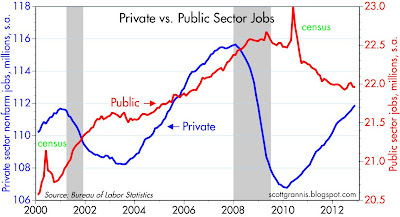 Despite declining jobs in the past few years, public sector employees have not suffered nearly as much as their private sector counterparts over the past decade: private sector jobs are only now back to where they were in early 2002, whereas public sector jobs have risen on net by 1 million (almost 5%). It's still the case that the best job security and the best pay and benefits can be found in the public sector. Thanks to below-trend growth in the labor force and the relatively tepid growth of jobs, the economy has fallen farther behind its long-term growth trend than at any time in modern history. This is the weakest recovery ever. Fewer people working means the tax base is a lot smaller than it could be, and that is main source of a shortfall in tax revenues. Faster economic growth, powered by faster job creation, is the key to shrinking the fiscal deficit from the revenue side. Raising tax rates will only risk retarding the rate of growth. Are you listening, Mr. Obama? The Fed is doing all it can to promote faster growth, by purchasing on net about $1.5 trillion worth of MBS and Treasuries in the past four years. 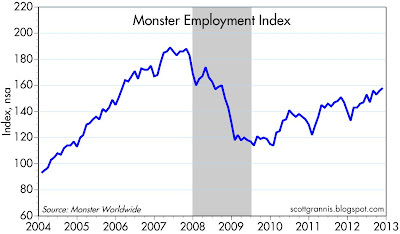 So far, however, there is no sign that they have managed to increase the pace of jobs growth. 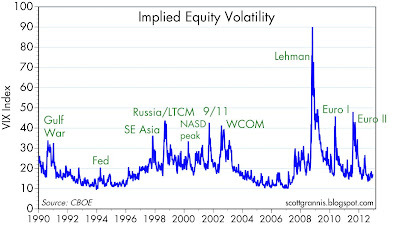 Their main accomplishment has been to satisfy the world's almost insatiable demand for risk-free short-term securities, which in turn has been driven by fear of sovereign defaults, a double-dip recession, the expectation that massive federal deficits will inevitably result in a huge increase in tax burdens, and concerns that monetary stimulus could prove to be very inflationary. As the chart above shows, the market's current expectation for inflation over the next 10 years is 2.5%, which is pretty much average. But it's nowhere near the deflationary levels that most Keynesian models have been predicting given the economy's weak recovery and the unprecedented output gap that currently exists. 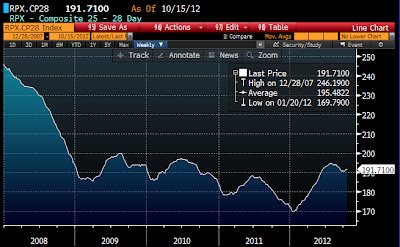 The chart above is a more sensitive measure of inflation expectations. The blue line shows that the bond market expects inflation to average a little over 3% during the period 2018-2023. That's not very frightening, but it does suggest that what's driving the rise in equity prices over the past year or so is inflation expectations rather than growth expectations. The Fed has absolutely succeeded in snuffing out any deflationary threat, but instead of boosting jobs growth, they have merely boosted the market's confidence that future cash flows to U.S. businesses will be rising by at least 2.5-3% per year, even if the economy posts very weak growth. The negative real yields on TIPS, which are at or close to all-time lows, are a clear sign that the market expects future economic growth to be dismal. 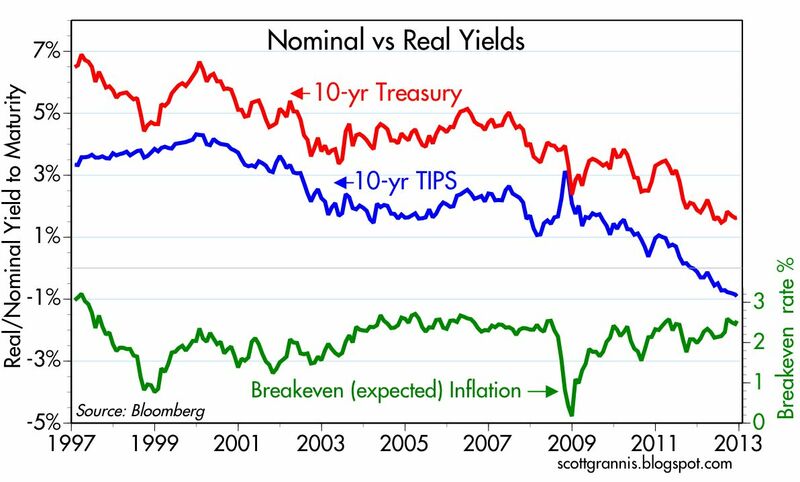 At the same time, the inflation expectations built into TIPS and Treasury prices say that the market expects inflation to be at least as high in the future as it has been in the past. 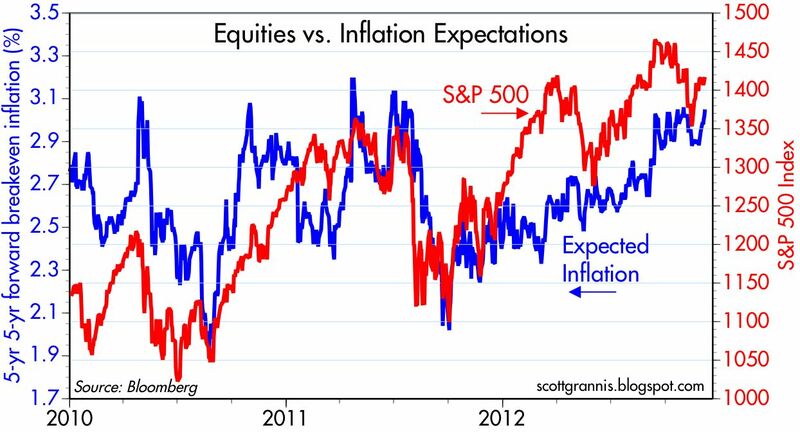 Growth expectations are falling, while inflation expectations and equities are rising. Translation: equities are behaving more like inflation hedges these days, than like barometers of real growth expectations. UPDATE: Nobel prizewinner Edward Prescott comes to a similar conclusion regarding the current 13% "output gap" that I show in the fourth chart of this post. See his op-ed in the 12/12/12 edition of the WSJ: "Taxes Are Much Higher than You Think." Increased tax and regulatory burdens, coupled with increased income redistribution schemes, likely explain why the gap is so large.